Have you considered joining our forum? It's full of like-minded people who love to help out and have a natter. We reckon you'd fit right in. We have just completed a scheduled downtime to update the forum software, so we hope you like the slightly new format and features. Data Protection: In light of GDPR coming in, we also want to remind you that at any point you have the option to change to an ID that is not linked to your name or professional identity if you prefer (just email an admin with your choice of user name). We can also edit individual posts to anonymise them if required. I would also remind you to check your user control panel to ensure that you have an up-to-date email address and have selected the options that you want in terms of communication. We very rarely send out emails, and have pledged to never send more than 5 in a 12 month period, but we do let you know when you can download a new copy of Aspire, and we try to create an annual chance to give us structured feedback. We also occasionally write a newsletter, or give you the chance to participate in our research or other site developments. So we would hope that these are communications that you would want to receive! Welcome! Hopefully there is content relevant to all career stages, and a chance to connect with peers all over the UK and elsewhere in the world. Welcome to clinpsy. If you are new here, you'll probably want to click on the "forum" tab, where there is always lots going on. We've got a wiki for the 250 questions we are asked the most often about clinical psychology in the UK, and lots of discussion topics - about 140,000 posts on 15,000 topics - as well as a livechat area where you can interact in real time with other members. 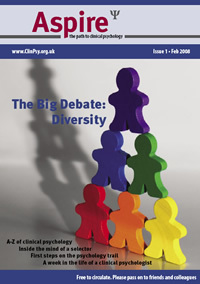 I blog at https://clinpsyeye.wordpress.com/ about a mixture of things related to life as a clinical psychologist. Why not take a look, comment, continue the conversation on the forum? Just a quick update to say that all the site features are now accessed by the forum. That is where you will find the current discussion about all aspects of clinical psychology, the job adverts, information about how to post adverts for jobs, courses and events. So get clicking on the menu bar above to register and join in. Please note that new registrations are manually checked and authorised to prevent spammers being able to sign up and promote their wares on our forum, so it may take a couple of days to activate your account. Just be patient and we'll get to it. In the meanwhile you can still browse and search most of our content - it is just the members sections, the qualified peer consultation group and the LiveChat facility which you need to be a member to access. Are you thinking about becoming a Clinical Psychologist? Do you know other people who are? Let them know about ClinPsy, where they can find valuable, relevant and up-to-date information in our wiki, and receive advice from like-minded individuals and professionals in our online community. If you want to spread the word, feel free to download our poster. Prizes awarded for pictorial evidence of the most strategic poster placement! A lot has been going on at ClinPsy lately, with the site and forum redesign, and introduction of advertising to say the least. Work still carries on (for it never truly ends). A new issue of Aspire is in the works and we're anxious to get it out to you all. If you have any comments, compliments, complaints or suggestions, please feel free to sign up to our forum and speak your mind.